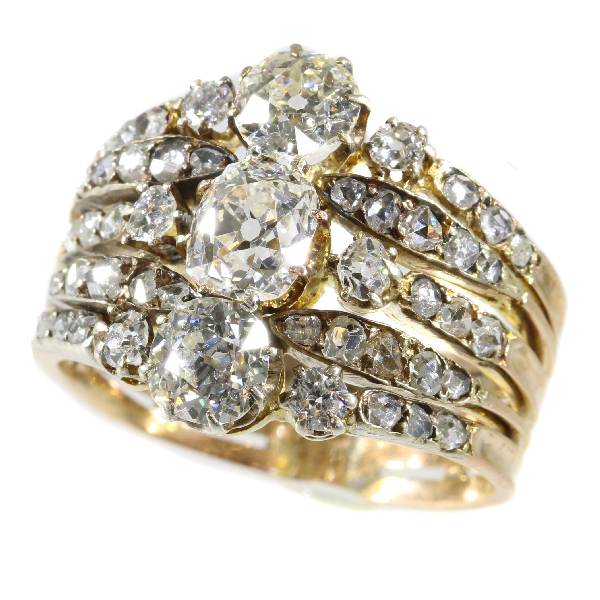 Astounding Victorian diamond ring: Description par door Adin Bijoux Anciens. Diamond(s): One old European cut diamond with an estimated weight of ± 1.05ct. (colour and clarity: G/H, si/i). Two old brilliant cut diamonds with an estimated weight of ± 1.20ct. (colour and clarity: H/K, si/i). Six old brilliant cut diamonds with an estimated weight of ± 0.45ct. (colour and clarity: G/K, si/i). 38 rose cut diamonds and senailles . A senaille is a simplified rose cut diamond, a small diamond chip with perhaps a few polished facets. We do not have the weight of the rose cuts diamonds nor the senailles which is normal in our trade when it comes to rose cut diamonds and senailles. Total diamond count: 47 pcs. Total diamond weight: (without rose cuts) approx. 2.70 crt.